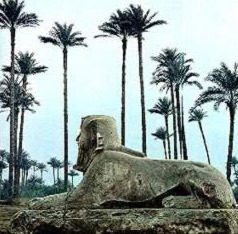 Near the remains of Memphis stands the Alabaster Sphinx. The Alabaster Sphinx was carved in honor of an unknown Pharaoh most likely during the eighteenth dynasty, between 1700 and 1400 BC. Although there was not an inscription, the facial features suggest that it was in honor of Hatshepsut or Amenhotep II or Amenhotep III. Amenhotep III is thought to be the builder of the Luxor Temple. The Alabaster Sphinx is 8m (26 ft) long and 4m (13 ft) tall and weighs around 90 tons. It has corroded over the centuries, but remains very impressive. This monument may have stood outside of the Temple of Ptah along with the Colossus of Ramses II. The Alabaster Sphinx spent many years lying on its side in water. This was responsible for the damage to the surface of the monument. The sphinx is sometimes referred to as the Calcite Sphinx. Calcite is an opaque white stone that is often times called alabaster. The Alabaster was quarried at a place east of 'Amarna called Hatnub. Calcite was also believed to have, in a mythical sense, solar connections. It was not often used as a building material. The type of figure known as a sphinx is created with the body of a lion and the head of royalty. The lion is in a crouching position with its paws outstretched. The human head is adorned with the covering reserved for kings of that particular period.